6000 people in Lebanon have been surveyed for crucial data on their experience of the Lebanese justice system. HiiL’s latest report includes key findings on the state of justice in Lebanon, as well as the experiences of 1200 Syrian refugees’ too. HiiL’s latest report includes key findings on the justice system in Lebanon, including data on refugees who make up 20% of the people surveyed. The study is part of a large multi-country project commissioned by the Dutch Ministry of Foreign Affairs. 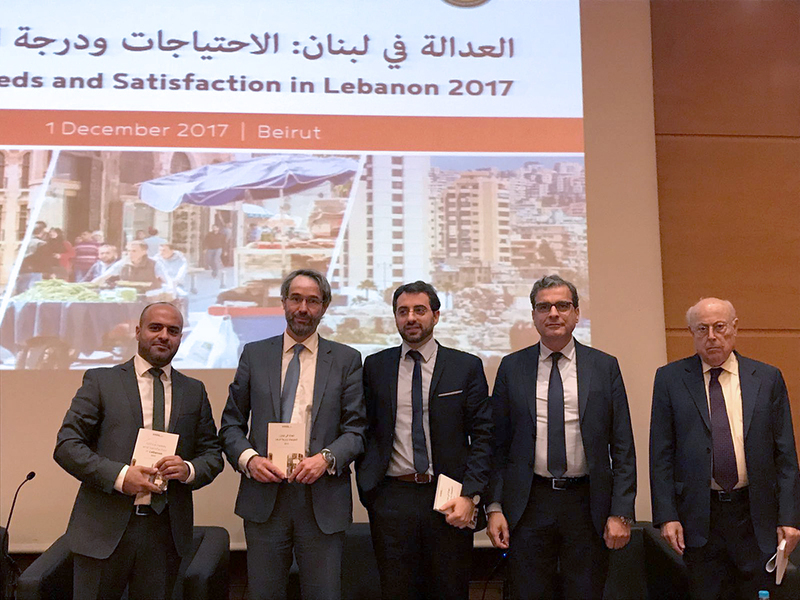 The report was produced and launched in Beirut in cooperation with ACRLI, the Arab Centre for the Development of the Rule of Law and Integrity. Released on December 1st 2017, the report is an insight into justice from the users perspective. Important data includes the statistic that 3.1 million people in Lebanon face one or more serious legal problems every four years (68%). Other key findings from this report include issue prevalence, impact, legal information and advice, and dispute resolution. The most serious problems are neighbour disputes, employment and family related issues. Gender also emerged as a decisive factor in justice equality. It was found the women are disproportionately affected by family legal problems. Most of these disputes revolve around divorce, but domestic violence is also a pressing issue. These disputes have a strong impact on citizen’s lives – however, people are very active in seeking legal advice to resolve the disputes. Among other findings a correlation was found between low education levels and/ or income and seeking legal information and advice. At the time of the interview, 6/10 actively sought legal advice, yet on top of this and in spite of action being taken, 53% of the legal problems were not settled – meaning for 1.1 – 1.2 million people, their legal problems remained unresolved. 1200 Syrian refugees were interviewed for the report. The Syrian refugees living in Lebanon report legal problems slightly less often than the rest of the population (65%). However, they are in a particularly vulnerable position with respect to access to justice, since their legal status in Lebanon is precarious. Syrian refugees report problems which are also common for the Lebanese citizens. However, grievances around ID documents are very prevalent among the Syrian refugees. Seeking legal information and taking action is much less common among Syrian refugees than with citizens. Many of their problems are unresolved (70%) at the time of the interview. The report ends with a number of recommendations, underlining that there is a need to pay special attention to vulnerable groups, and to build a system that listens to the users of justice. The full list of recommendations and the entire report is available to download here in both English and Arabic.